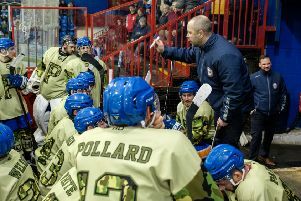 Brad Moore struck twice as Peterborough Islanders made a winning start to their National League South 2 (East) season at Planet Ice on Saturday. They twice came from behind to see off Invicta Mustangs 6-3 and the result was still in the balance until they struck twice in the final minute. Nathan Pollard fired into an empty net after the Mustangs netminder had been pulled and Connor Stokes pounced on a powerplay with two seconds remaining. James Pentecost and Connor Hunter hit the first two Islanders goals. They entertain Lee Valley at Planet Ice on Sunday (5pm).